I'm getting quite a laugh out of Sourpuss's "Gingerdead" holiday sweater. The little gingerbread skeletons are so cute! Here's a matching pair of red and black Gingerdead leggings. They also make a Gingerdead sweater dress in case that runs more to your liking. You can find more Gingerdead clothes on eBay. Here's another irreverent holiday option from Sourpuss: "Sleigh Me." 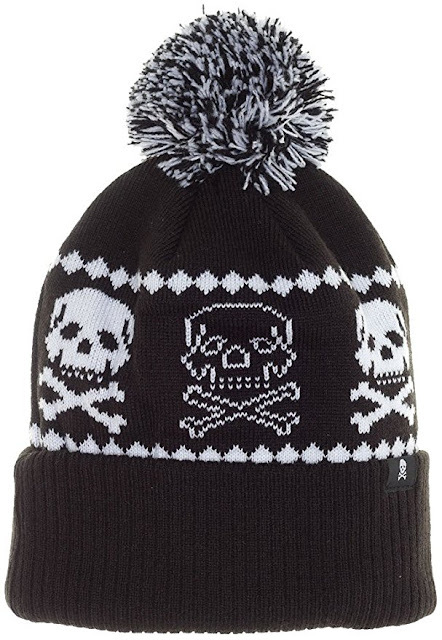 The design features a skeletal reindeer, an undead snowman, skulls and snowflakes. How merry! You can keep your legs warm with the matching Sleigh Me leggings, too. And here's a jolly matching Sleigh Me knitted cap, too. You can find more Sourpuss "Sleigh Me" clothing on eBay.